Caryn Brause AIA LEED AP received her M.Arch degree at the University of Virginia and her B.A. from the University of Pennsylvania. In addition to teaching, Brause is the principal of SITELAB Architecture + Design in Northampton. The practice is a laboratory for investigating the broad context of the “site” through client-driven projects, theoretical investigations, and community collaborations. Design work examines the transformation and reuse of that which we have in abundance including existing building stock, underutilized urban and suburban landscapes, and repurposed materials. Brause’s teaching investigates critical skills for contemporary practice, both technological and interpersonal. She is author of The Designer's Field Guide to Collaboration, winner of First Prize, 2017 Building Technology Educator's Society (BTES) Book Award. 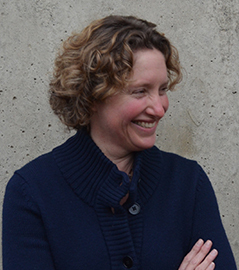 She received an AIA/ACSA Practice + Leadership Award in 2016 and an NCARB Award for the Integration of Practice and Education in 2013 for her project Voices from the Field, which uniquely blends instruction in design, materials, methods, and documentation with first-hand observation of construction and professional practice. The ongoing research examines an experiential pedagogical model for understanding the myriad issues that comprise contemporary architectural design decision-making and project delivery. She is a founding editorial board member of the Technology | Architecture + Design (TAD) Journal, which is dedicated to the advancement of scholarship in the field of building technology, with a particular focus on its translation, integration, and impact on architecture and design. The Designers Field Guide to Collaboration (New York: Routledge, 2017). ‘Collaboration: Propelling An Expanded Practice,’ Brooklyn says "Move to Detroit," Proceedings of the 105th Annual ACSA Meeting, Luis Francisco Rico-Gutierrez & Martha Thorne (Eds.) Detroit, MI, 2017. ‘Beyond the Visible: Skillsets for Future Interior Architecture Practice,’ The Interior Architecture Theory Reader, Gregory Marinic, editor. (New York: Routledge, 2017). "I-391 Gateway," Holyoke MA. A $50,000 National Endowment for the Arts "Our Town" Award with the City of Holyoke and Joseph Krupczynski, 2016. ‘Intern architects in the academy: preparing for future practice,’ Future of Architectural Research Proceedings of the 2015 ARCC Conference, Chicago, IL 2015.